Rochester Toyota has a wide selection of new 2016 Toyota Tacoma trucks for sale in Rochester, New Hampshire. The all new Tacoma has a bold new look and offers more strength and capability than ever before. Designed with a more muscular exterior, aggressive front grill and available hood scoop this Tacoma has an attitude that won’t be confused with the competition. The new Tacoma is equipped with a 3.5-liter V6 direct-injection engine with 278 horsepower and 265 lb-ft of torque at 4600 rpm for unlimited towing, hauling and off-road cliff climbing. 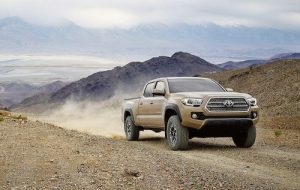 The Tacoma TRD Off-Road’s Crawl Control, Multi-terrain Select feature and electronically locking rear differential all work together to allow it to conquer any rocky, muddy, sandy or slick surface it encounters. Toyota also included a GoPro mount on the windshield to help the drivers capture all Tacoma off-road adventures. Inside the cabin are tougher yet more refined surfaces. Sturdy but soft touch fabrics, brushed chrome accents and available leather-trimmed seating add a touch of civilization to this rugged truck. Toyota has made improvements to the Tacoma’s cabin-to-bed seal and reduced outside airflow for less wind noise and a much quieter ride. An available 4.2 inch multi-information display can be customized to show the driver current mpg, song selection, individual tire pressure and much more. The new Tacoma also offers more visibility and safety features. An integrated backup camera allows the driver to see what is directly behind the truck and a Blind Spot Monitor detects any vehicles or objects hiding out of the driver’s view and illuminates a warning indicator on the outside mirror. Built with new construction techniques and high-strength steel, the Tacoma doors and body are now stiffer and stronger. Tacoma pick up trucks are also equipped with Toyota’s award winning, six point, Star Safety system of integrated safety technology. The 2016 Toyota Tacoma is offered as the SR. SR5, TRD Sport, TRD Off-Road and Limited models, all with a choice of eight exterior colors. With a starting MSRP of $23,300 it will surely be one of our best selling pick up trucks. If you are shopping for a new truck, why not stop by and test drive a 2016 Toyota Tacoma in Rochester, New Hampshire today?